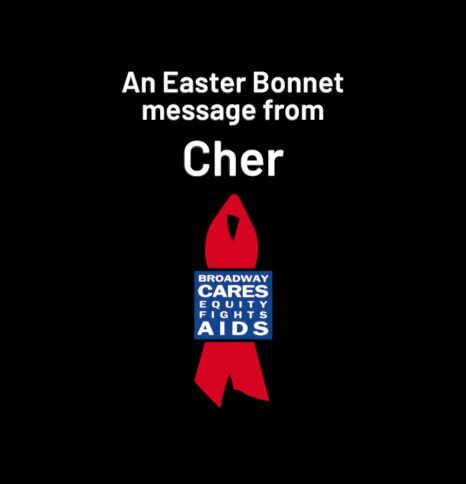 A bevy of Broadway’s brightest stars joined a sold-out audience on March 11, 2019, to celebrate and motivate the LGBTQ community and its allies through gender-reversed renditions of beloved show tunes, spectacular choreography and a record-breaking fundraising total at Broadway Backwards. 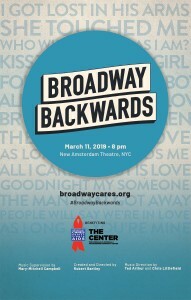 Broadway Backwards, which was produced by Broadway Cares at the New Amsterdam Theatre, featured a cast of 130 performers and a live, 12-piece orchestra. It started with two of Broadway’s favorite singing-and-dancing leading men – Gavin Creel and Andrew Rannells – and ended with a stirring anthem led by the evening’s host, Tony Award nominee Jenn Colella of Come From Away. As the evening’s openers, the Tony-winning Creel from Waitress and Hello, Dolly! and two-time Tony nominee Rannells from The Boys in the Band and TV’s Girls and Black Monday invited the audience to join in the celebration and “come play with [them]” in a playful rendition of “Where You Are” from Kiss of the Spider Woman. They were joined by the Broadway Backwards ensemble in effervescent choreography created by Paul McGill, which paid homage to some of the most iconic dances in Broadway history. Emmy and Golden Globe Award winner Darren Criss of Hedwig and the Angry Inch and TV’s The Assassination of Gianni Versace: American Crime Story battled a case of pre-wedding jitters with the rapid-fire patter of Stephen Sondheim’s “Getting Married Today” from Company. Criss, who just got married himself last month, was joined by Ward Billeisen, Michael James Scott and the Broadway Backwards ensemble. Spurred by a gaggle of attention paid to Tony winner Donna McKechnie of A Chorus Line, two-time Tony winner and Chicago star Bebe Neuwirth sought reassurance with a playful and affectionate rendition of “I Still Get Jealous” from High Button Shoes. The audience revelled in the opportunity to see the two legendary dancers break into Jerome Robbins’ iconic choreography, restaged by Stephen Reed. Moulin Rouge‘s Robyn Hurder and Fiddler on the Roof‘s Alexandra Silber put a twist on the roles of Tulsa and Louise in a romantic restaging of Gypsy‘s “All I Need is the Girl.” Silber lovingly and wistfully watched Hurder fantasize about her perfect partner. The piece, originally choreographed by Jerome Robbins, was restaged by Tony nominee Tony Yazbeck of The Prince of Broadway, who played the role of Tulsa and performed the choreography in the 2008 revival of Gypsy. Tony nominee Ariana DeBose of Summer: The Donna Summer Musical showed off her impressive dancing skills, backed up by a female ensemble, in a fun and flirty rendition of Bye Bye Birdie‘s “A Lot of Livin’ to Do.” The sultry and salsa-infused number was choreographed by Hamilton‘s Karla Puno Garcia. Iconic Bob Fosse choreography got the Backwards treatment when On the Town‘s Clyde Alves and Priscilla Queen of the Desert‘s Nathan Lee Graham led Sweet Charity‘s iconic “Big Spender.” The song’s quintessential dance hostesses were replaced with an alluring all-male ensemble, with Fosse’s choreography meticulously restaged by Mimi Quillin. A lovestruck Head Over Heels‘ Bonnie Milligan sought advice from a park bench-sitting stranger in “I Met a Girl” from Bells are Ringing. As an the archetypal cynical New Yorker, Tony winner Debra Monk of Cat On a Hot Tin Roof and TV’s Mozart in the Jungle helped Milligan find herself amid a park full of LGBTQ love connections. The number was choreographed by Broadway Backwards’ creator Robert Bartley and Robbie Roby. When an Abercrombie and Fitch employee, played by Tuck Everlasting‘s Andrew Keenan-Bolger, was bullied by his brawny coworkers and menacing manager, played by Casey Garvin, Brian Martin, Alex Ringler and Janelle Lutz, he remained unphased because he was head-over-heels in love. Choreographed by Bartley and Roby, the group performed West Side Story‘s “I Feel Pretty,” complete with rhythmic shirt folding and an homage to the show’s “America” choreography. The Prom‘s Caitlin Kinnunen and Isabelle McCalla filled the New Amsterdam Theatre with love and warmth as they performed Songs for a New World‘s touching “I’d Give it All for You,” ending the song with a tender kiss. Frozen‘s Caissie Levy shared an enchanting version of “What More Can I Say” from Falsettos. The musical arrangement gave the beloved show tune a singer-songwriter feel, featuring onstage guitarist Ann Klein. Leading ladies Tootsie‘s Lilli Cooper, Smokey Joe’s Cafe‘s Nicole Vanessa Ortiz and The Cher Show‘s Teal Wicks turned Pacific Overtures‘ “Pretty Lady” from a story of randy sailors on the prowl into a loving song of courtship. Broadway legend and Tony Award winner Len Cariou of Sweeney Todd and TV’s Blue Bloods) charmed the audience as he raised a glass to the “Ladies Who Lunch” from Company. Golden Globe Award winner and Tony and Academy Award nominee Kathleen Turner of Who’s Afraid of Virginia Woolf? comically lamented the loss of her love in “I Guess I’ll Have to Change My Plan” from The Little Show. Tony winner Rosemary Harris of My Fair Lady made a special appearance to thank the audience and performers for their invaluable support of Broadway Cares/Equity Fights AIDS and The Center. Bartley, Broadway Backwards‘ creator, wrote and directed this year’s show. Mary-Mitchell Campbell served as music supervisor, Ted Arthur and Christopher D. Littlefield were music directors. The creative team included lighting designer Timothy Reed, costume designers Johnna Fettinger, Jess Gersz and Natalie Loveland, prop designers Jenna Snyder and Alexander Wylie and sound designers Kurt Fischer and Marie Renee Foucher. Jeff Brancato was production stage manager. 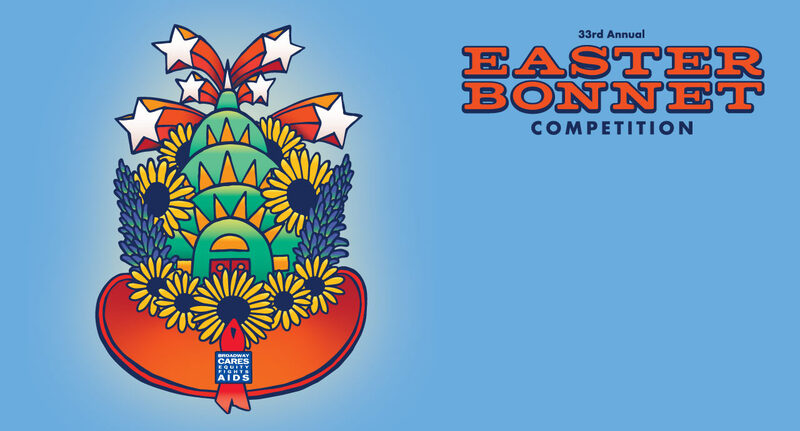 What began as a small, grassroots concert performed in the community room at The Center in 2006 has grown into a highly anticipated event presented in one of Broadway’s most beautiful theatres. 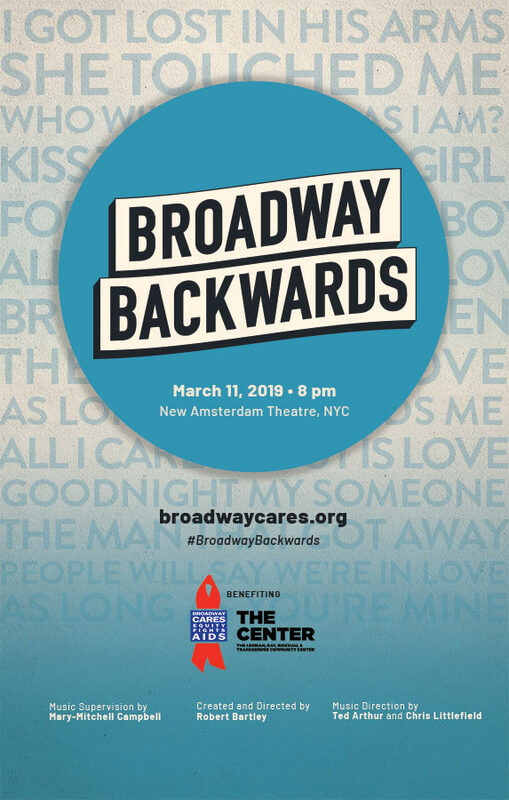 In its 14 editions, Broadway Backwards has raised $4.8 million for Broadway Cares and The Center. Major sponsors of Broadway Backwards included Celebrity Cruises and The New York Times. @zandibill @amaristarrbye @NetworkBway @BryanCranston Thanks correct. Posters are only available at the shows' theaters after performances during our #RedBuckets fundraising seasons.